The existence of a new Star Wars cartoon based on a line of super-deformed toys has leaked out of Skywalker Ranch. A source at IESB has revealed a new Star Wars animated series that will be based on the Star Wars: Galactic Heroes line of toys. 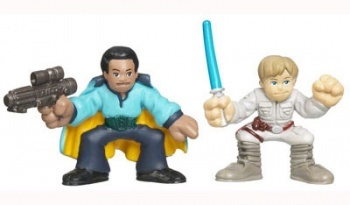 The Galactic Heroes toys are a collection of super-deformed miniature figures that include a wide variety of characters from Lando Calrissian to Yoda. A director has just been hired to guide the new show, which reportedly has a working title of Squishies. This may seem like an incredibly odd name, but it makes a little more sense when you consider that a very young audience of preschoolers to kindergartners is being targeted for the show. Even for a kid's cartoon, this is a pretty young age group, so maybe Squishies could end up being some kind of educational program in the same vein as Yo Gabba Gabba or the like, but one that features lightsabers and Boba Fett. I, for one, think that would be pretty cool for kids. The MTV Movie Blog received comment from Lucasfilm Animation that appears to confirm the project: "Lucasfilm Animation has many projects in development. One is for a younger audience but it's in very early development and too early for any details." Some are calling this new show a money grab, but I think it's way too early to judge. The transition of Hasbro's Star Wars: Galactic Heroes toys into an animated series is reminiscent to what was done with Hasbro's Marvel Super Hero Squad line, which also became a television show and later spawned a videogame. Lucasfilm Animation launched Star Wars: The Clone Wars as a regular television series for kids in 2008, a successful venture that warranted a release of two Clone Wars Wii games, so it makes sense to try to go for a repeat and aim it at a different audience. Those of us that want a more mature Star Wars experience will probably have to wait for the untitled television series that is currently in production and expected by 2012.